This beautiful clip art set will be delivered to you in transparent .png file format via a .zip file. There are 15 elements in this set, each element has been saved as a high quality .png file. 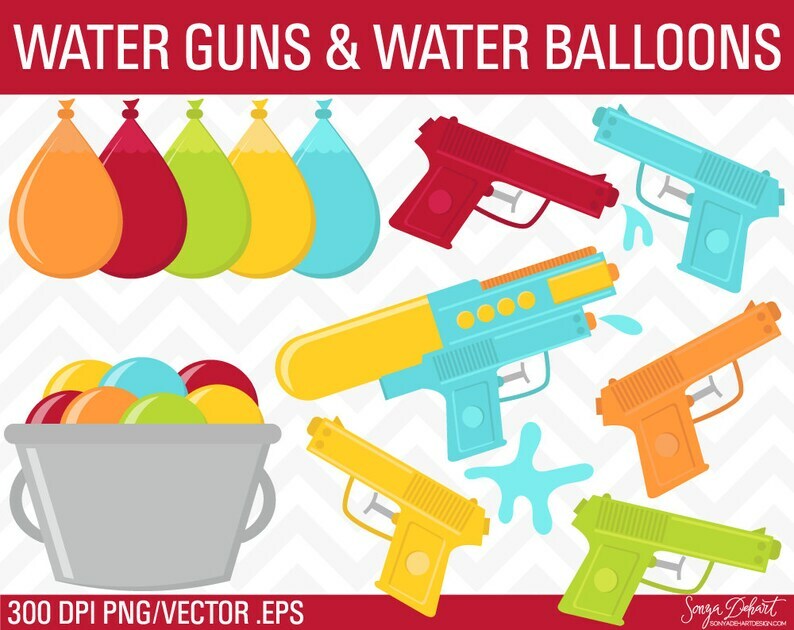 5 water guns, 1 super water gun, 5 water balloons, 1 tub of water balloons, and 3 water splashes. All files saved separately and compressed together in a zip folder. Visit the purchases page on Etsy to download your paid items. NO REFUNDS, Credits or Exchanges on Digital Goods. Digital files cannot be returned, therefore refunds/exchanges are not accepted. If you are having trouble with your files, please message me and I will help where I can. Copyright 2011 - Current ©Sonya DeHart | All Rights Reserved. Great SVG file for personal use. Due to the DIGITAL nature of my products - refunds WILL NOT BE ISSUED on any product once it has been downloaded, unless you mistakenly purchased 2 of the same items. It is the buyer's responsibility to make sure he/she knows how to use Zip/PNG and or EPS files before they purchase. It is also their responsibility to know which software they need to open and use these files, prior to making a purchase. NOTE: I cannot offer you any software tutorials or technical support for using your own computer. If you have an issue with your download or with files, please convo me and I will do my best to help you, or replace the item - with the same item emailed directly to you, instead of a download. Please allow up to 24 hours for my response, as I am not at my computer 24/7. I will do my best to resolve your issue in a timely manner. These images must be used in collaboration of YOUR OWN work and cannot be sold as is. ✘ Images may not be sub-licensed, resold, shared, transferred, or otherwise redistributed on its own (even for free). ✘ Images may not be used in a pornographic, defamatory, offensive, or unlawful manner. ✘ Images may not be used as a trademark, service mark, or any registered logo. ✘ Images may not be distributed as a part of any clip media collection, or scrapbook kit. ✘ Images may not be used for any type of MASS PRODUCTION. (1000 distributions or more). Anything more requires an extended license. Copyright 2011 - Current © Sonya DeHart Design | www.sonyadehartdesign.com | All Rights Reserved.